Our expertise in the fields of Molecular Biology, Protein Biochemistry, Immunochemistry and Microbiology enable us to develop highly specific and sensitive biorecognition molecules and their subsequent immobilisation in biosensor applications. Likewise, we develop biodetection systems for use in human, animal and environmental health, and food traceability and safety. 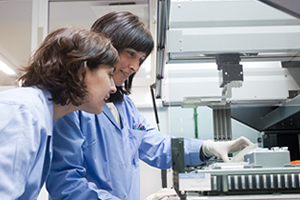 Our scientific and technological expertise in the fields of molecular biology, protein biochemistry, immunochemistry and microbiology, together with the wide-ranging experience of our researchers, enable us to design and develop highly specific and sensitive biorecognition molecules and to immobilise them for subsequent use in biosensors. We identify target molecules or analytes of interest in complex biological samples, such as whole pathogenic microorganisms and small protein-based molecules, and develop biorecognition molecules (aptamers, DNA probes and peptides) by combinatorial biochemistry for inclusion in one or more biosensors. Likewise, various bionanotechnology-based strategies, including the use of biorecognition molecules and magnetic particles, amongst others, are currently being assessed together with the "Nanoparticle Synthesis and Functionalisation" team in order to develop new biosensor configurations and apply the systems developed to bioanalytical problems of great interest for the biotechnology, food and environmental control industries.